At the Worldwide Alumni Gathering on Nov. 7, Gordon B. Hinckley, president of the Church of Jesus Christ and chairman of the Board of Trustees, praised BYU, its alumni, and its new president the majority of his address is printed here. Photo by Mark Philbrick. The other evening I happened to flip on the BYU channel on my television set. To my great surprise, I saw myself as the speaker at a devotional. It was a talk I gave in September 1983, 20 years ago. 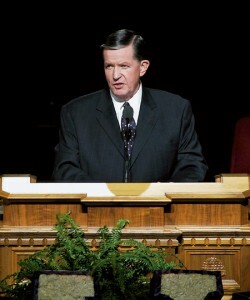 Jeffrey Holland was then the president. He looked much younger in those days. So did I. So did you. Those of you who may have been in that audience have since gone places far and wide across the earth. You have achieved a realization of your dreams. You have married and have children of that age when every parent worries. I hope you hold her in fond remembrance and that the more you look about this world, the more you treasure what she did for you. Here you learned the skills, the basic knowledge which has blessed your life ever since. And here, at the feet of a remarkable faculty, you developed a strong and solid knowledge of the gospel of Jesus Christ and the faith which grows out of such knowledge. The Church made a significant investment in you, and you have returned it with interest. You are men and women who love the Lord, who get on your knees and pray to your Father in Heaven, who serve wherever you are called to serve and in whatever capacity, who honor and love and appreciate your companions, many of whom are likewise the products of BYU. You know the true meaning of fatherhood and motherhood, a relationship which you share with your Father in Heaven, who is the Father of the spirits of all of us. 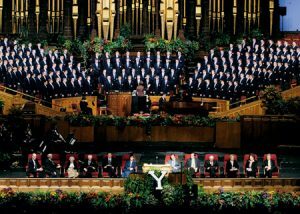 Broadcast from the Tabernacle on Temple Square, the Worldwide Alumni Gathering had a potential satellite audience of 330,000. Alumni chapters worldwide sponsored more than 2000 events in connection with the gathering, which was the first of its kind. Photo by Mark Philbrick. What a remarkable group you are. You serve on the faculties of most of the universities of America, as well as others abroad. You are scientists who are making a tremendous contribution with your discoveries and research. You are doctors and dentists and lawyers. You are architects and engineers. You are educators, school administrators, sociologists, biologists, economists, and business executives. You are good people who love the Lord and who in turn are loved by Him. I believe you appreciate your alma mater today even more than when you were a student. It has left an indelible imprint upon your very natures. The seeds of testimony planted and nurtured in those early days have grown into tall and rugged trees of faith, which bring shelter and beauty to many around you. There was a time when we almost had to beg students to come to BYU. Now they are turned away in great disappointment. The student body has grown in number. We are going to enlarge the Salt Lake Center, which will add substantially to that number. BYU and its associate institutions, BYU–Hawaii and BYU– Idaho, have all been joined together to make a university system that is unique and large and strong. I wish we could build and operate more such. The fact is that a university is a very costly institution to maintain. Furthermore, with the growth of the Church across the world the task would be endless in building such establishments. We try to make up for all of this with the institute program, which is accomplishing tremendous good. 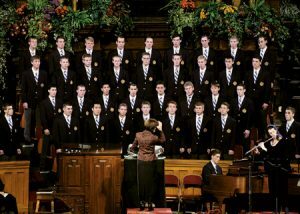 The BYU Men’s Chorus performs at the broadcast. In addition to the chorus, the program featured three video presentations and remarks by President Gordan B. Hinkley, BYU president Gordon B. Hinkley, BYU president Cecil O. Samuelson, Alumni Association president Brent W. Romney, and Alumni Association president-elect Carr C. Krueger. Photo by Mark Philbrick. But the BYU experience, as each of you can testify, is unique and different. In many ways it is priceless. How fortunate you are. How blessed you are. And, I hope, how thankful you are. In the years to come your ranks will be enlarged by many thousands more. Your alma mater will grow in the respect of leaders throughout the earth who will increasingly recognize the unique abilities and unusual qualities of BYU graduates. This is already happening. I understand that some firms have previously required people to have 10 years of experience in computer animation before hiring them. They are now taking graduates directly out of BYU in acknowledgment of their superior training on the supercomputer and in consideration of their exceptional character. I am confident that as the years pass this will increase not only in industrial design but in other disciplines as well. I am also confident that BYU graduates will increasingly be sought for and welcomed in graduate schools here and across the world. The stature of BYU graduates will enhance the good name of the Church wherever they go and do inestimable good in advancing the work of the Lord. As moral and ethical values weaken and decline in societies worldwide, the gap between the world and this Church will widen. Those who live according to LDS standards will stand out from the crowd and receive recognition as those who can be counted on. Don’t judge BYU today by football. That too will improve. This has been a tough year. But better years lie ahead. Again, I am confident that BYU is destined to be a winner all around. But the greatest thing that BYU will give its students in the future is what it has given you in the past. That is an unshakable faith in the living God, He who governs the universe and who is also our Father in Heaven to whom we may go in prayer. It is faith in the Lord Jesus Christ, the Son of God, who condescended to leave the royal courts on high and come to earth, here to live and teach and heal, and then to give His life on Calvary’s cross, thence to be buried in Joseph’s tomb and to arise the third day, “the firstfruits of them that slept” (1 Cor. 15:20), through whose redeeming grace all shall be resurrected. BYU’s newly inaugurated president, Cecil O. Samuelson, told alumni about BYU’s student mentoring emphasis. The gathering offered and opportunity for alumni to meet the new president. Photo by Mark Philbrick. It is faith in the most remarkable vision in human history, the appearance of the Father and the Son to the boy Joseph to usher in this, the dispensation of the fullness of times. It is faith in the Book of Mormon as a second witness of the reality and the divinity of the Lord Jesus Christ. It is faith in the holy priesthood conferred upon you, my brethren, and under the authority of which you act as a servant of the Lord. It is these pillars of faith which most of you first acquired from your good fathers and mothers and which were greatly strengthened when you attended BYU, which today sustain you and bless you wherever you are. Hold fast to them. Magnify them. Treasure them. God bless you, my beloved associates in this great work. We are immensely proud of you. Go forward with faith in the living God and trust in our divine Redeemer, His Son. Serve well in the Church which is Their creation. Walk with integrity before the world, and rear your families “in the nurture and admonition of the Lord” (Eph. 6:4). May heaven smile upon you as you go forward with your lives is my humble prayer, in the name of Jesus Christ, Amen. 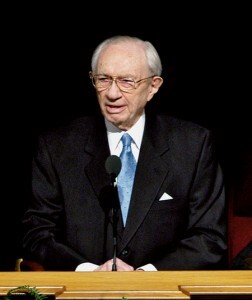 This article is an excerpt from President Hinckley’s address at the Worldwide Alumni Gathering, Nov. 7, 2003, in the Tabernacle on Temple Square.